Propellerhead Software's Black Friday offering is a real zinger. 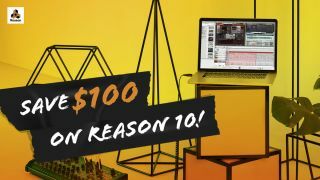 Not only has it put its Reason 10 DAW on sale, but everyone who buys it will also get Drum Sequencer and the Europa VST/AU synth plugin thrown in for nothing. Reason 10 is an excellent all-in-one production solution, giving you everything you need to make music in one piece of software. Now's a great time to buy it, too, as not only is the software currently being offered at a $100/£70/€90 discount, but you also get the Drum Sequencer Rack Extension and the Europa VST/AU synth plugin for free. That's a pretty storming deal whichever way you slice it. Go to the Propellerhead Software website to find out more.